Unifi booth counter to approach and attract customer. Eminent Display responsible for a Unifi service of consultation to the customer who ever were applied the Unifi services. The service that Eminent display has offered was include the sales service and management application from the customer. Therefore, Eminent Display are to be assigned a sales structure for the growing of Unifi services. Eminent Display Sdn Bhd will going to establish and maintain the obligations of this development product for just to making the sales services on the top level. Eminent Display also equipped with the promotion sales standard services by providing booth counter and distribution of broucher information. The booth was assigned to attract the unifi product to the customer. This is to make potential Unifi customer well known about the Unifi services and packages that was offered by TM. And discover a whole new world in entertainment, communication and information. 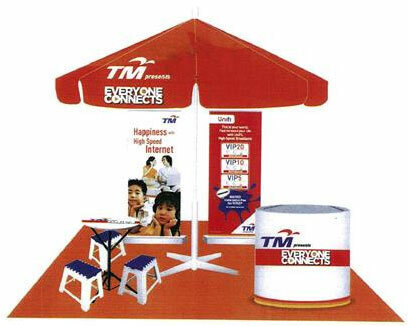 TM is a company which is involved, amongst others in the provision of telecommunications and multimedia products and services and is desirous at the request of the Customer to provide Unifi Services to the Customer, the Service (as hereinafter defined) on TM‘s network, which will allow the Customer the access to Internet on the terms and conditions set forth herein, as may be amended from time to time by TM. UniFi is a broadband service that uses fibre optics to deliver high speed internet, phone and IPTV services to customers’ homes. The type of technology used to deliver UniFi service to customers’ homes would depend on the type of customer premise. If the customer’s premise is a landed property, Fibre to the Home (FTTH) will be used whereas if the customer’s premise is a high rise building, Very high speed Digital Subscriber Line 2 (VDSL 2) will be used. Enjoy TV over broadband (IPTV–Internet Protocol Television) where TV channels can be accessed through a private network in high definition format with high stability. IPTV also offers interactive content through its video–on–demand feature.